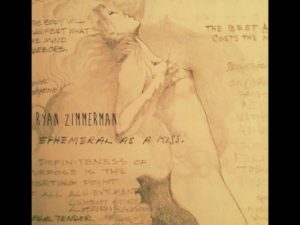 The Reason is the first effort on Ryan Zimmerman’s new EP, Ephemeral as a Kiss. The track showcases a nice blend of styles, with hints of acts as broad as Soundgarden and John Mayer. The specific array of styles that listeners can pick up after their first listen to Zimmerman’s Ephemeral as a Kiss EP is pretty substantial. Beyond his own unique approach to things, it is the fact that Ryan can pull out a hint of Monster Magnet or Soul Asylum and make it worth with current audiences that showcases his own skill as a musician. While this first track is easily ready for a college rock station, there is an intensity to the instrumental side of thing (particularly the guitar solo at about the 2:40 mark) that will appease even the most jaded audiophile. Backpacks is a touching, wistful effort that is particularly impressive due to the depth of the composition. While it sounds pretty straightforward when one passively listens, the depth of these arrangements ensures that fans will continue to find new twists and turns five or ten listens in. Lola and John is an important effort in that it showcases Zimmerman’s ability to weave a compelling story. Fans of Nirvana will hear a bit of Cobain in Ryan’s vocals here, as little more than a guitar is needed to add further depth to this composition. For the Meek is the final track on the Ephemeral as a Kiss EP; it’s a vital effort for anyone that is trying to learn about Zimmerman as it showcases a hint of reggae and ska. This final effort is a nice shot in the arm, providing a bit of a quicker tempo as this extended play comes to a close.